Apple TV 4K may be grabbing all the headlines, but don't sleep on Roku. The AV accessory company is apparently prepping a new streaming stick capable of porting through 4K High Dynamic Range (HDR) content, and at a likely cheaper price than Apple. The new 4K HDR Roku Streaming Stick+ was uncovered by Zatz Not Funny thanks to "a trusted source," though we don't have official word from Roku yet. ZNF reports the stick will be here this autumn, or sometime between the end of September and mid-December (almost certainly well before Christmas). This is said to be a mid-range device that includes Roku's universal remote. While it is more capable than the older HD streaming-only model, the new stick will keep its thumb-drive profile. As for the 4K HDR Roku Streaming Stick+ price, we're lacking specifics, but the current Roku Streaming Stick costs $39.99 / £69.99 on Amazon. The Apple TV 4K starts at $179 / £179 / AU$249. Another Roku rival, the Google Chromecast Ultra, already streams 4K HDR. Google's disk-shaped dongle costs $69 (£69 / about AU$90). Google could unveil an updated Chromecast during its October 4 event, when we'll no doubt meet the Google Pixel 2 smartphone, in addition to other devices. 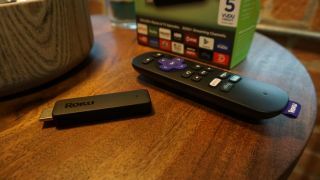 Roku's new 4K HDR streaming stick isn't all that's planned this year, however. The company also reportedly has a 2017 Roku Express planned to sit on the lower end. This streaming device offers up to 1080p streaming for around $30 (about £25 / AU$40). The Roku remote is also said to be getting a revision, including the addition of greater TV control. No word on when Roku's new devices will become official, but it's likely not long now.